Learning Spanish is not always easy. A good teacher is important. An appropriate environment is equally important. We try to emphasize both at Apoyo Spanish School. Ours is the longest operating of the Nicaragua Spanish schools, and our teachers have the most experience of those of any of the schools in Nicaragua. Our teachers have conducted numerous teacher trainings; many of the teachers in other Spanish schools in Nicaragua have learned to teach Spanish with us. Students of Apoyo Spanish School enjoy private Spanish classes with the most experienced teachers in Nicaragua. Photo Pablo Somarriba. Learning Spanish in Laguna de Apoyo Nature Reserve means receiving high-quality classes with experienced teachers in the longest-running program in the country. It also means enjoying a natural environment, in which monkeys are overhead, the clear water of Lake Apoyo is a few steps away, and interactions with rural people are the order of the day. Spanish classes at Apoyo Spanish School are held from 8 am to 12:30 pm, and lots of homework keep the students busy and learning afterward. Photo Pablo Somarriba. Our teachers at Apoyo Spanish School have developed our own study materials, based on more than twenty years of accumulated experience. Our methods are so successful that many Spanish teachers in other schools use our materials as their instruction guides. Spanish classes are adapted to the level of the student, from the most basic beginner to advanced students needing academic or business Spanish skills. Photo Pablo Somarriba. Students at Apoyo Spanish School receive exposure to the local culture during their stay, including Nicaragua foods and cooking, popular culture, history and politics. Nicaragua is a poor country in many ways, but its culture and history are rich beyond comparison. How do they make that sopa de queso? Spanish lessons may extend into the kitchen. Photo Pablo Somarriba. Laguna de Apoyo Nature Reserve is a great place to see wildlife. Every week, bird experts on our staff take Spanish students, visitors, and volunteers on nature walks. Howler monkeys, oropendolas, trogons and motmots abound in our vicinity, easily seen during the day. Evening walks may uncover owls, snakes, and tarantulas! International topics are common among the many nationalities who visit us at Estacion Biologica. The patio is a great spot to relax and share with others. Photo Pablo Somarriba. There are also some spectacular views in the volcanic landscapes in and around Laguna de Apoyo. The views, for instance, from Coyotepe are expansive, both across Masaya and the Volcano Masaya with its laguna hidden in the caldera, and toward Tisma and Lake Nicaragua. The horrific history of Coyotepe, with invasions of the gringos, and later, imprisonment and torture of the opponents to the dictatorship, can be heard in the echoes throughout the cavernous structure of the fort. 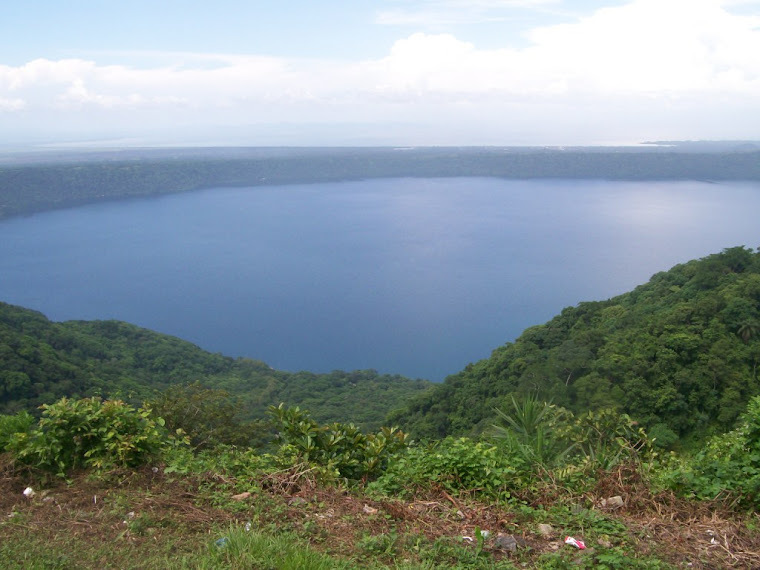 Lake Masaya and the city of Masaya are below Coyotepe, one of the sites visited by students of Apoyo Spanish School. Photo Pablo Somarriba. By walking the paths of Laguna de Apoyo Nature Reserve, one can retrace the steps of Cacique Diriangen and view the landscapes which motivated his people to resistance against the Spanish invasion. His spirit lives on in the resistance of the people of Masaya and Los Pueblos. Everything done with a smile! Photo Pablo Somarriba. Most students of Apoyo Spanish School enjoy the multinational company at Estacion Biologica, but one can make an entirely Nicaraguan experience en espanol easily. Our staff conduct all activities in Spanish. Afternoon activities are designed to expose the students of Apoyo Spanish School to the language in new settings. Photo Pablo Somarriba. Apoyo Spanish School is in a rustic but clean and safe setting, with toucans, monkeys and forests overhead. The lake is best enjoyed by a daily swim or SCUBA dive, but the spectacular views from along the edge of the Apoyo crater are to be appreciated, too. Granada and Lake Nicaragua are seen in the distance from the Catarina mirador. Photo Pablo Somarriba. The people who live around Laguna de Apoyo are artisans from centuries past. Leather working, wood carving, weaving natural fibers, and fired ceramics are among the products made in the region. The lifestyle of the Nicaraguan is one of farming, artisanry, and rural values, even when people move to the big cities. Every Nicaraguan has artisan crafts on display at home. How to embellish a ceramic object before its firing is the lesson of the day, in San Juan de Oriente, the pottery capital of Nicaragua. Photo Pablo Somarriba. The teachers of Apoyo Spanish School come from the area, and know the reality of the rural people of our area. In their families vegetables, fruits, and grains are grown, artisan crafts are made, and vendors hawk all kinds of dry goods in the municipal market. Educations have come to the younger generation, thanks to the advances of the Nicaraguan Revolution, but the lifestyles still value the country style life. Throwing a pot on a wheel is not as easy as it looks, especially when the motor for the wheel is your foot! Photo Pablo Somarriba. Read more about the Apoyo Spanish School at http://www.gaianicaragua.org/spanish.html.